We are grateful to Chris Bradley of Bramhall who has donated some books of his late father, Dennis, to our group library. Also thanks to other members & non- members for donations. 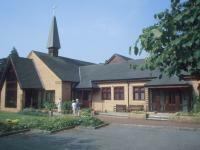 The Bramhall Groupmeets in the Main Hall of the United Reformed Church on the corner of Robins Laneand BramhallLane South, SK7 2PEat 7.30. p.m. Unfortunately due to the increase in costs of room hire, speakers etc. since the group’s formation, our admission cost will increase to£2 including refreshments from January 2014. Those of you who attend on a regular basis will know that at the end of the meetings we ‘make some time’ for refreshments and give people the chance to discuss their ancestral research problems with others in the hope that they can sort some of them out. Visitors are always very welcome but we trust that those who attend regularly will join the FHSC. We are grateful to Chris Bradley of Bramhall who has donated some books of his late father, Dennis, to our group library. Also thanks toother members & non- members for donations. The OxfordNames Companion – a definitive guide to surnames, first names & place names of the British Isles. Tracing Your Family Tree – Jean Cole & John Titford. Remembered – Marple Men who fell in The Great War – Clarke, A. Cook & J Bintcliff. Gibson Guides - Electoral Registers since 1832 & Burgess Rolls,Poll Books c.1696-1872, Land Tax Assessments c.1690-c.1950. An Introduction to Occupations – Joyce Culling. FFHS. An Introduction to Poor Law Documents before 1834– Anne Cole. FFHS.